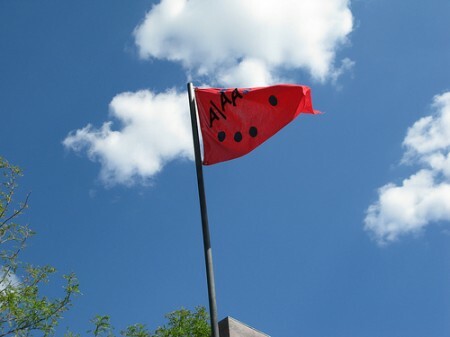 Flags of our ancestors grace the A/AA. 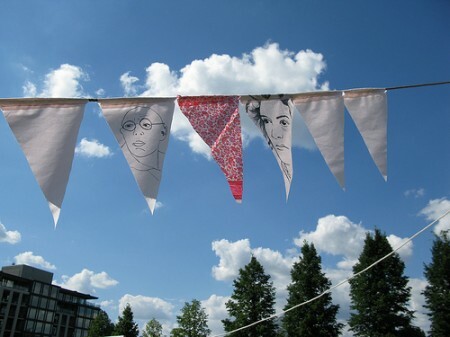 Waving in the air above the construction site/temporary school on the Walker green that is Red76’s Anywhere, Anyplace Academy are a cast of characters drawn onto pink flags. Portraits of A.A. Bronson, Patti Smith, Starhawk, Grace Lee Boggs, Frank Little, Abbie Hoffman, Carol Queen, and Emma Goldman among others surround the site. 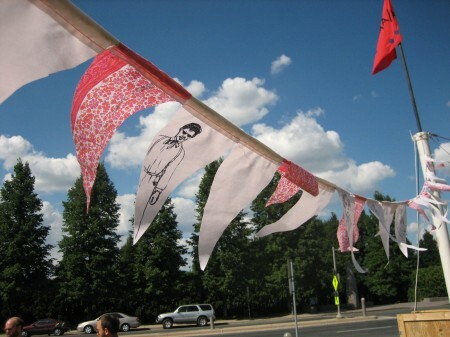 Like pennants from a radical prep school or Tibetan prayer flags that send wishes into the wind to be carried on, these “temporary ancestors” demonstrate the kind of revolutionary commitment to community and justice that inspires the A/AA and Surplus Seminar as a whole. The red namesake flag was designed by a young contributor early in the project and interpreted in fabric by curator/artist Courtney Dailey.